8 Climbing log entries Found. Another one of my meteor-shower-on-a-mountaintop outings... and again, not exactly as successful as I would have liked. Still, unquestionably enjoyable! Perfect weather apart from too much cloud. Again, like earlier in the year - no bugs. No wind. Slept outside in the open, it was so nice. Everything was perfect, except, again.... pesky clouds. Special request hike for work colleague Veetil and wife Rahkee: something short and steep. After work-colleague Veetil's thumbs-up on his first ever ADK climb to Noonmark in March of 2016, he requested another, this time with his wife Rakhee. They wanted something short and steep (or maybe they said short and sweet and I just misheard them). In any case, the perfect choice was Catamount. Veetil and Rakhee enjoyed the scrambly and slabby challenges on Catamount, and came away wanting more. A beautiful day on a small but beautiful peak. A quick jaunt up scenic and scrambly Catamount Mountain to test out Andy and Andrea's new boots. Beautiful November day - a cool wind add some chill, but a trend to completely clear skies meant a strong sun often warmed things up. No ice or snow to speak of, other than a little bit of frost-tipped branches at the very top. The view-filled, scrambly ascent was as enjoyable as ever. Andy and Andrea's new boots performed well for them - no hot spots or other issues. Although our speed wasn't overly quick, the Catamount trail's short distance meant that we completed the entire ascent and descent in under four hours. 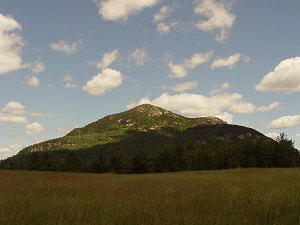 Definitely one of the Adirondack's best short hikes. A return to Catamount - nearly two years to the day after the last time. Again a crisp and cool early spring morning, although far more snow on the ground this time. New to me were the infrastructure improvements at the trailhead - Catamount is now a much more official destination. Started off barebooting, but switched to traction enhancement at the first uphill. We were able to follow tracks and stay with boots only until shortly after the subsummit, where the track ended and we had to start breaking trail (with snowshoes). Beautiful fresh snow started to become a bit wet as a strong spring sun warmed things up. An only slightly breezy summit and perfectly clear skies yielded a very pleasnt top-spot. The way down was quick and uneventful, save for the troublesome balling underfoot, caused by the effect of the increasingly warm conditions on very fresh snow. Given our large group, our elapsed total time was a relatively sedate five hours round trip. 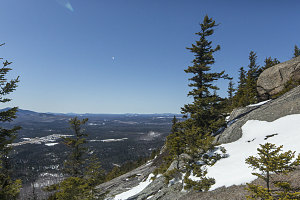 Catamount - part 1 of a 2-peak Easter Saturday in the Adirondacks. Another cold day in late March of 2013. Sunny, but cold. Good for winter climbing conditions, though, and perfect for our quick ascent up the feisty little peak of Catamount Mountain. A mix of snowshoes, bare-booting and micro-spikes were the order of the day, owing to the changing snow conditions and depth. The Chimney section and the slabs presented no climbing difficulties; the only problem was a bit of routefinding through the col between the south summit and main summit. Excellent atmospheric conditions on top: good visibility, beautiful sun, and light winds. Since we were aiming to head down to Keene Valley and climb Snow Mountain before it got too late, we did not stay long. We arrived back at the trailhead about 15 minutes shy of four hours. Not all that fast. Snow - part 2 of a 2-peak Easter Saturday in the Adirondacks. Continuing on from our fun and sporty climb of Catamount mountain, we decided to tackle Snow Mountain - a short little peak in Keene Valley that I had yet to do, and which I had heard had nice views on top. We quickly bare-booted it up the mostly snow-free lower trail, using the high-water route due to a main trail closure. 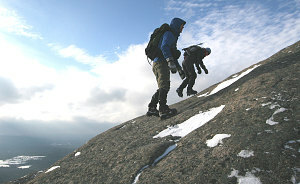 Above this, we encountered little difficulty over the remaining 1000 feet to the summit. The open ledges just southeast of the summit were surprisingly scenic - an excellent panorama from Giant all the way over to Dix and Nippletop. Conditions were perfect: light winds, clear, late-day sun, snow on the peak-tops. A perfect little outing to round out the day.